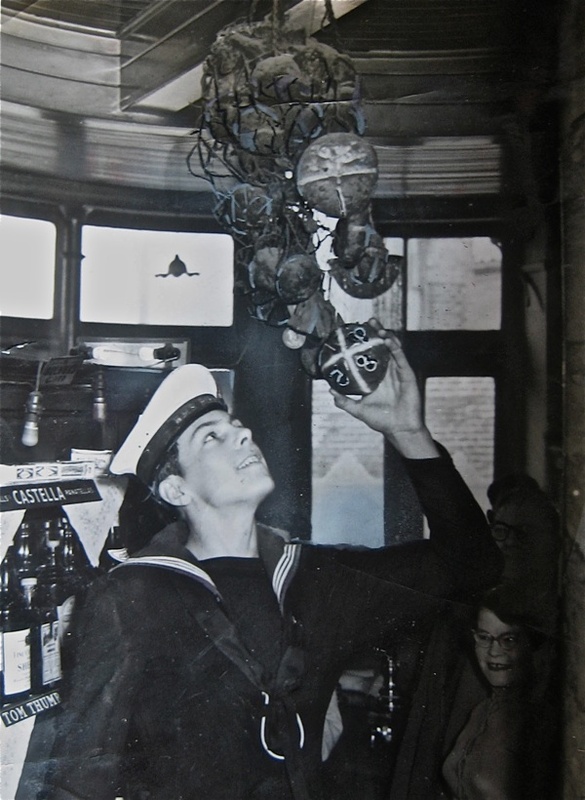 A net of Hot Cross Buns hangs above the bar at The Widow’s Son in Bromley by Bow and each year a sailor comes to add another bun to the collection. Yet no Hot Cross Buns are eaten in the ceremony, they are purely for symbolic purposes – left to dry out and gather dust and hang in the net for eternity, London’s oldest buns exist as metaphors to represent the passing years and talismans to bring good luck but, more than this, they tell a story. 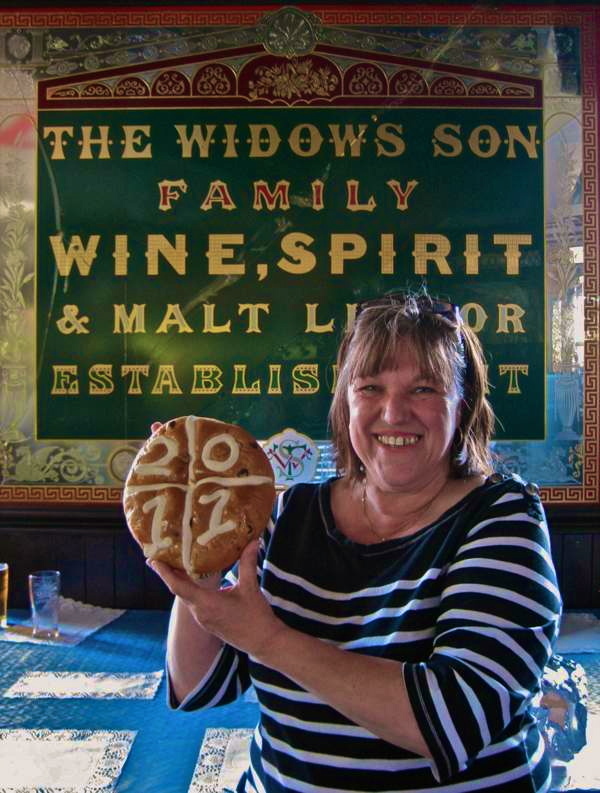 On Good Friday, what could be more appropriate to the equivocal nature of the day than an event which involves both celebration of Hot Cross Buns and the remembrance of the departed in a single custom – such is the ceremony of the Widow’s Buns at Bow. The Widow’s Son was built in 1848 upon the former site of an old widow’s cottage, so the tale goes. When her only son left to be a sailor, she promised to bake him a Hot Cross Bun and keep it for his return. But although he drowned at sea, the widow refused to give up hope, preserving the bun upon his return and making a fresh one each year to add to the collection. 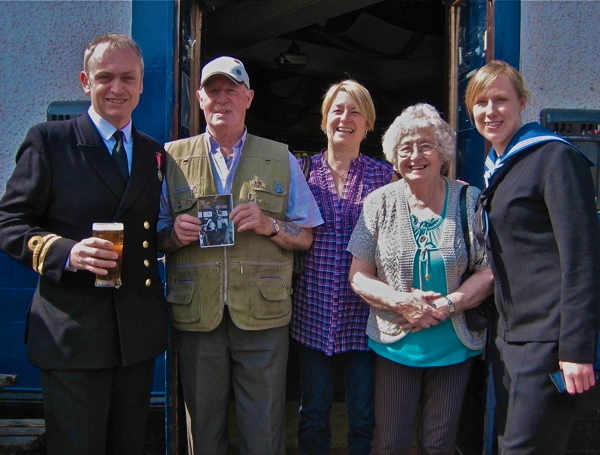 This annual tradition has been continued in the pub as a remembrance of the widow and her son, and of the bond between all those on land and sea, with sailors of the Royal Navy coming to place the bun in the net every year. Behind this custom lies the belief that Hot Cross Buns baked on Good Friday will never decay, reflected in the tradition of nailing a Hot Cross Bun to the wall so that the cross may bring good luck to the household – though what appeals to me about the story of the widow is the notion of baking as an act of faith, incarnating a mother’s hope that her son lives. I interpret the widow’s persistence in making the bun each year as a beautiful gesture, not of self-deception but of longing for wish-fulfilment, manifesting her love for her son. 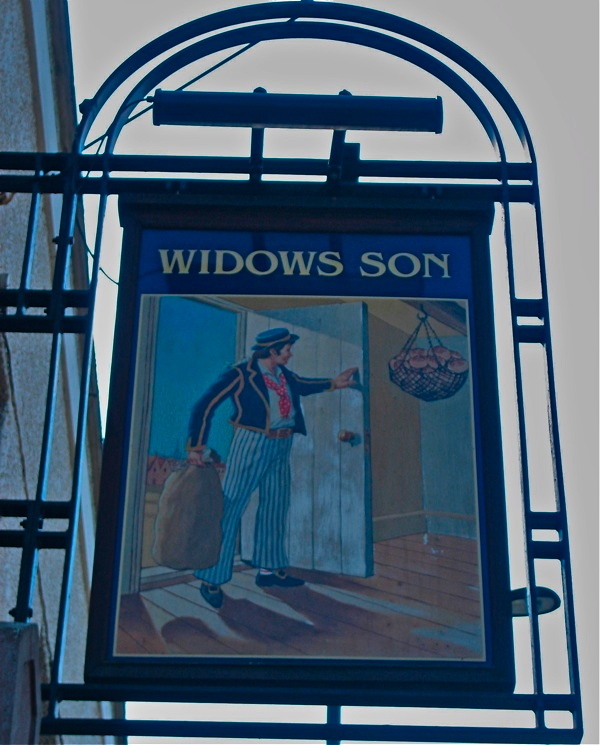 So I especially like the clever image upon the inn sign outside the Widow’s Son, illustrating an apocryphal scene in the story when the son returns from the sea many years later to discover a huge net of buns hanging behind the door, demonstrating that his mother always expected him back. When I arrived at the Widow’s Son, I had the good fortune to meet Frederick Beckett who first came here for the ceremony in 1958 when his brother Alan placed the Hot Cross Bun in the net, and he had the treasured photo in his hand to show me. 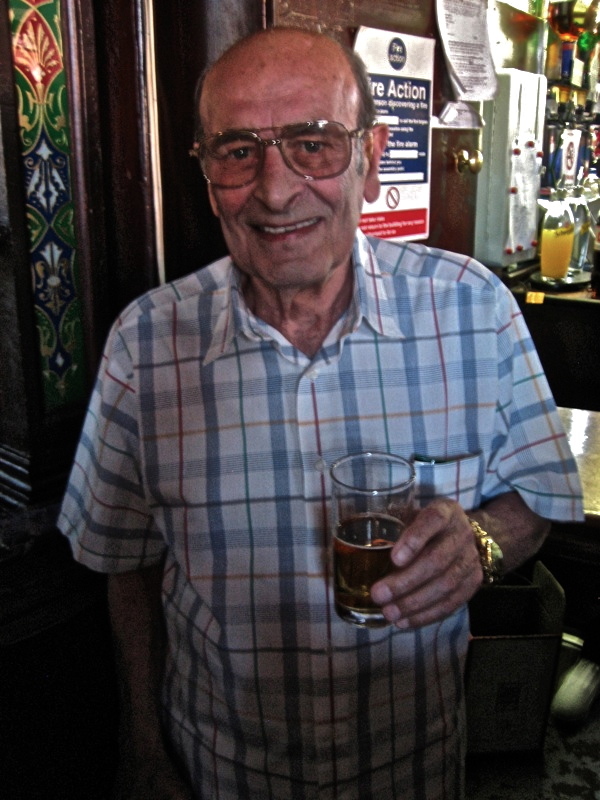 Frederick moved out from Bow to Dagenham fifteen years ago, but he still comes back each year to visit the Widow’s Son, one of many in this community and further afield who delight to converge here on Good Friday for old times’ sake. Already, there was a tangible sense of anticipation, with spirits uplifted by the sunshine and the flags hung outside. The landlady proudly showed me the handsome fresh Hot Cross Bun, baked by Mr Bunn of Mr Bunn’s Bakery in Chadwell Heath who always makes the special bun each year -” fabulous buns!”declared Kathy, almost succumbing to a swoon, as he she held up her newest sweetest darling that would shortly join its fellows in the net over the bar. 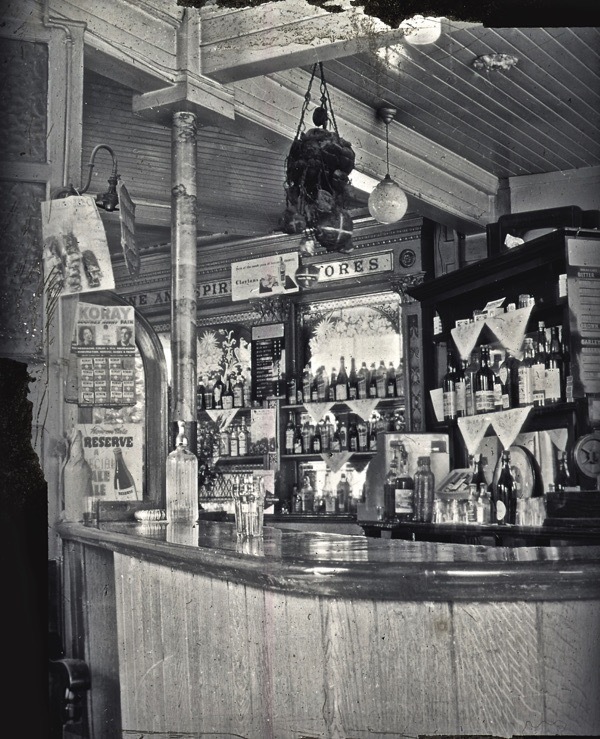 There were many more ancient buns, she explained, until a fire destroyed most of them fifteen years ago, and those burnt ones in the net today are merely those few which were salvaged by the firemen from the wreckage of the pub. Remarkably, having opened their hearts to the emotional poetry of Hot Cross Buns, at the Widow’s Son they even cherish those cinders which the rest of the world would consign to a bin. 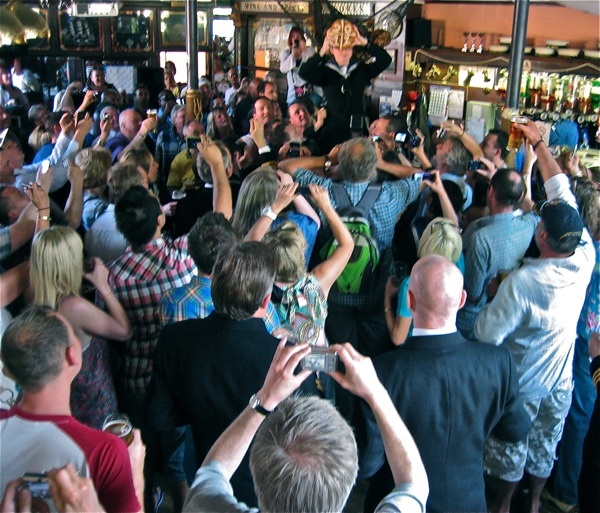 The effect of several hours drinking beer upon a pub full of sailors and thirsty locals became apparent in the pervasive atmosphere of collective euphoria, heightened by a soundtrack of pounding rock, and, in the thick of it, I was delighted to meet my old pal Lenny Hamilton, the jewel thief. “I’m not here for the buns, I’m here for the bums!” he confided to me with a sip of his Corvoisier and lemonade, making a lewd gesture and breaking in to a wide grin of salacious enjoyment as various Bow belles, in off-the-shoulder dresses with flowing locks and wearing festive corsages, came over enthusiastically to shower this legendary rascal with kisses. 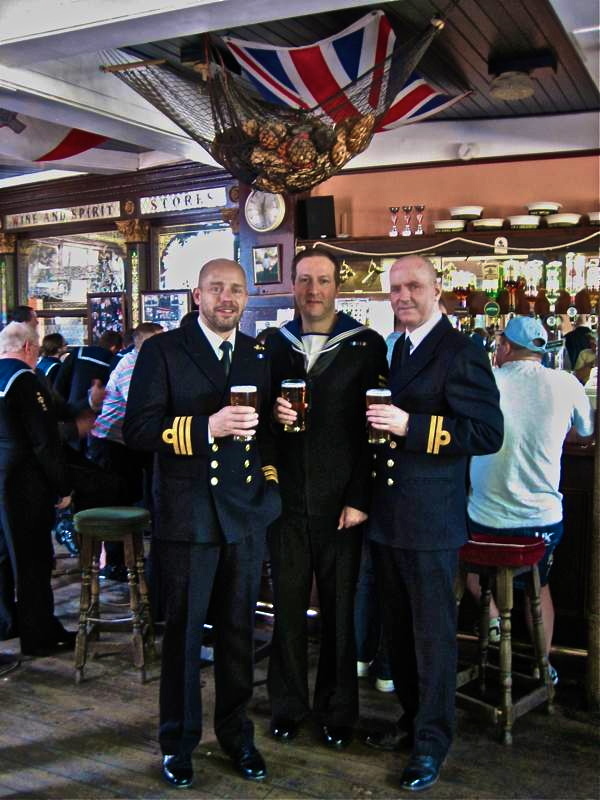 Peter Gracey, Nick Edelshain and Roddy Urquhart raise a pint to the Widow’s Buns. Tony Scott and Debbie Willis of HMS President with Frederick Beckett holding the photograph of his brother placing the bun in the net in 1958. 3 pm, Good Friday, 22nd April 2011. Be kept for his return. The widow kept her store. It’s a great tradition but for how much longer? I believe that the lease expires this year and the owners are a firm of developers. The tower blocks lining Violet Road encroach ever closer, so will the buns and sailors be back in 2016? 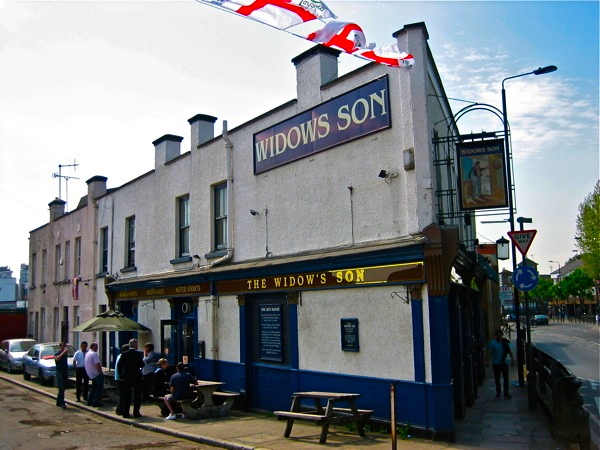 Last time I cycled past the Widow’s Son it seemed to be closed – good to know it was just a bump in the road for this pub and this cherished tradition. 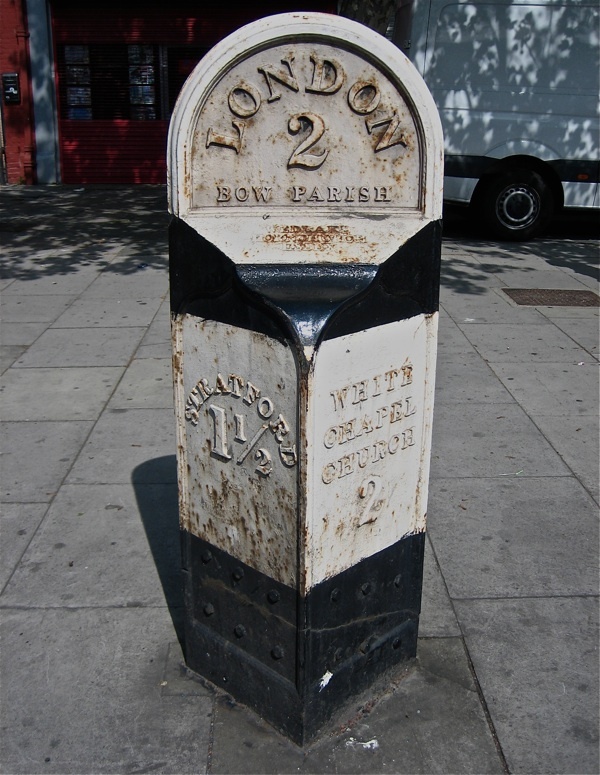 “A Widow’s Son of Bromley by Bow” — a very nice poem for Easter time! What an extraordinary story! This for me, has to be the best tale I have read on the Gentle Author. Immediately you have the images building up of a loving mother heartbroken that her only son has gone away to sea & is believed drowned. With her husband also dead, she is totally alone & for her son to be lost at sea is like the end of her life. To comfort herself & give her the strength to go on, each year this mother bakes her missing son a Hot Cross Bun (a symbol of hope). So there we have a net of rotting buns depicting living, death & hope, hanging in her house. The flies & the rotting dust must have been horrendous, especially in the summer heat, but these buns mean the resurection of life to this poor lonely woman. She has gone to these lengths in the hope her son will come back to her & eventually he does. But hey! yes he come back home – but how cruel, why did this son neglect his mother by never writing to her or visiting her over those missing years? Never letting her know he was alive? There is so much to this tale, representing the complexities of life. And the food of a mothers love. I love these old tales & traditions. Fascinating to think the pub is supposedly built over her cottage in the shape of a ship. Even today saliors congregate each year to this same spot to add the little bun of hope, of life & of love. The photos are wonderful. Thank you for sharing. And may all the men & women at sea return home to their families. My family passed a hot cross bun with a label giving a date from the Victorian era down through several generations. Unfortunately it was lost in my mother’s later years. Cannot this pub be designated as a community asset under recent legislation? Or even listed? It needs to be protected as a pub not another block of flats. I remember the time when almost the entire ceiling was covered with nets full of buns. This was before the devastating fire that destroyed most of them. I went to school in Bow, at Cooper’s Grammar School and we all knew the story of the Widow’s Son. I went there quite often with a couple of friends who lived nearby, it was a lovely place, a real community pub. It’s such a shame that places like this are being demolished to make way for ever more ghastly blocks of flats. I hope it survives.